My SIL Aubrey came up with the best Christmas tradition this year. She suggested making Christmas ornaments and exchanging them between the SIL's. What a fun idea! Something handmade, from the heart. So my quest began, and I decided I wanted to do little mitten snowmen. Many pattern prototypes later I ended up with this cute little guy. Well, actually he's not really that little and that poses a bit of a problem because he would be HUGE on a Christmas tree. Seriously, I can almost stick my hand in him. So...I'm probably going to have to develop a smaller knitting pattern or possibly make one out of felt. I'm still undecided. I'll let you know. Either way, the pattern for this not-so-little guy is below. Although he's too big for an ornament, I can't wait to add him to my Christmas decor! Using black yarn, cast on 30 sts. Row 23: Switch to red yarn, knit across. Join white yarn to remaining 15 sts. Repeat Rows 38-43. Fold mitten in half (right-sides together) and stitch along the edge. Flip the mitten right-side out. Using red yarn, cast on 10 sts. Work in stockinette stitch for 1 1/2 inches. Cut yarn leaving a long tail. Draw tail through remaining sts. Fold in half (right-sides together) and stitch along edge opposite fold. Flip right-side out. Sew red scarf to bottom red stripe on the mitten. Stitch red buttons to red scarf. 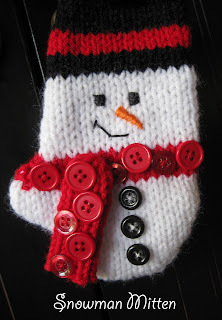 Stitch a column of black buttons down the belly of the snowman mitten. Using a satin stitch and black embroidery floss, stitch two eyes on the snowman's face. 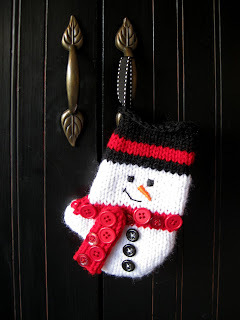 Using black embroidery floss, stitch a smile on the snowman's face. Using a satin stitch and orange embroidery floss, stitch a triangular "carrot" nose on the face. Fold ribbon in half and stitch to inside of left mitten corner. So CUTE! Love it! 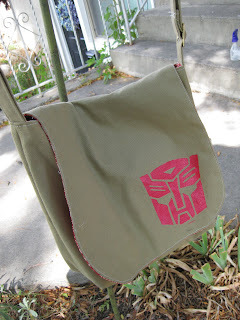 Thanks for posting the pattern!